Older hospital patients with dementia may be 'suffering in silence' because they are unable to communicate pain, a study suggests. Researchers from University College London's Marie Curie Palliative Care Research Department investigated the relationship between pain and delirium among people with dementia in hospital. They found that pain and delirium are common among patients with dementia on hospital wards, but that these conditions are 'often under-diagnosed and under-treated'. 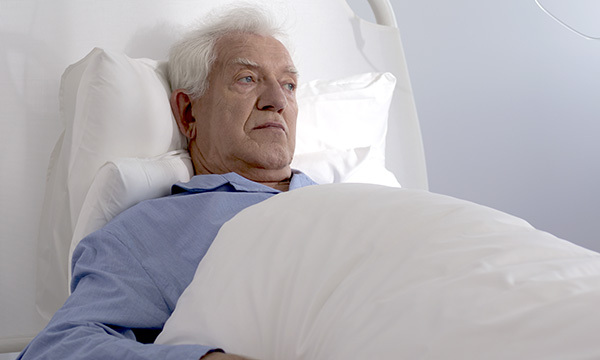 Delirium is a state of acute confusion, which can particularly affect older people. The team examined dementia severity, delirium and pain levels among 230 patients with dementia aged 70 and over who had been admitted to two hospitals in London. They found that almost half (49%) of the individuals experienced pain while resting, and that delirium developed in 15% of the patients studied. Of the 35% of study participants who were delirious and unable to self-report pain, 33% experienced pain at rest. The odds of being delirious were 3.26 times higher in participants experiencing pain at rest, according to the study, which was published in the journal Age And Ageing. The authors concluded that pain may be a risk factor for delirium. The research was jointly funded by the Alzheimer's Society and Bupa UK Foundation, and supported by the terminal illness charity Marie Curie. Its authors urged hospital staff to carry out regular assessments so that pain and delirium are managed effectively. University College London Marie Curie Palliative Care Research Department reader in old age psychiatry, Liz Sampson, said: 'In the UK, almost half of people admitted to hospital over the age of 70 will have dementia. 'It's deeply troubling to think that this vulnerable group of patients are suffering in silence, unable to tell healthcare professionals that they are in pain. Alzheimer's Society chief policy and research officer Doug Brown said: 'We know that people living with dementia can find it difficult to communicate, and when this concerns inability to communicate pain to hospital staff, it's extremely concerning, as it's not only upsetting and frustrating but can have serious consequences for a person's health. 'The link between delirium and pain found in this research shows that the problem may be stronger than previously thought.